The gales started up while I was sorting out the first draft of a novel I had written some time ago. 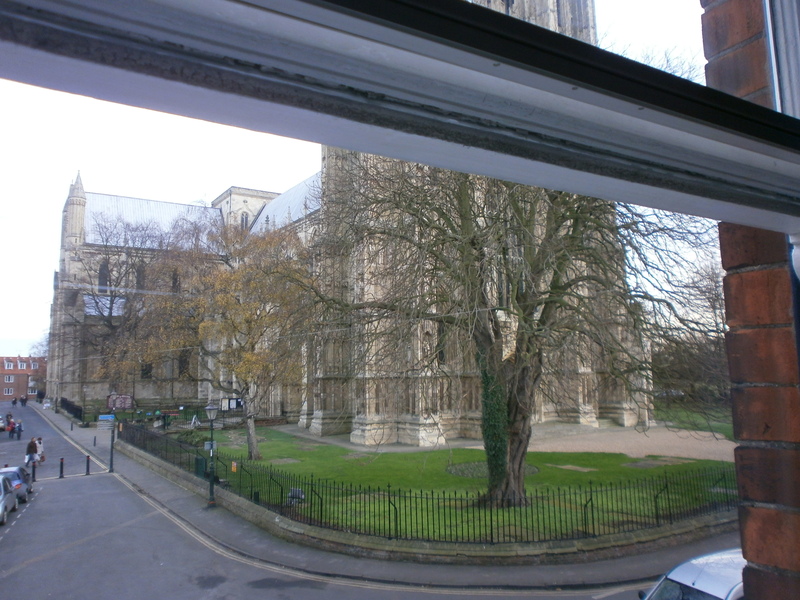 I was settling into my writing chair by the window that overlooks the Minster and watching the pale yellow leaves of the silver beech were dancing around the tree and over the ground. Across the road the window in a garret was swinging back and forth, faster, faster. Should I run across and tell them? I looked down at the button folder, apprehensive about taking the first chapter out of it. I was returning to an old companion, but after too long a wait? I hesitated and looked out of the window again. The chestnut was waving its bare branches amid the roar of the wind and beyond the silver birch, now almost stripped bare, the copper beech shivered leafless in the corner where the nave joins the north transept. The lower pane of the swinging window had a gash across it. Probably there’s no one there in the morning. Openings are perhaps the most difficult part of any work. I hesitated again, afraid of what I might find after so long. Instead I watched the clouds rushing across a pale blue sky, white and puffy first, and then tinged with grey. Heavy, more threatening, dark grey ones followed. The window was now hanging limp over the ledge, top hinge wrenched off. It might fall on someone below. Too late – the damage is done and the storm is still raging.